Search eBay auctions for Roy Lichtenstein on DVD or VHS. This font set was developed by P22 type foundry for the Albright-Knox Art Gallery and is inspired by their collection of Pop Art. Artists such as Warhol, Lichtenstein, and Rauchenberg sought to blur the lines between high and low art as well as the boundaries between art and everyday life. The alphabets and extras in this set reflect that spirit. » Buy the Pop Art font set from our advertiser, fonts.com powered by Agfa|Monotype. 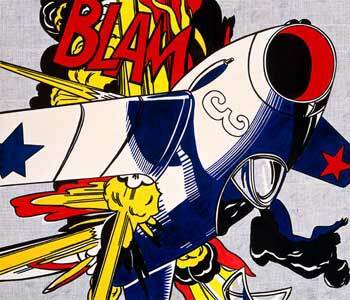 BLAM, Roy Lichtenstein, 1962. Oil on canvas, Size: 68 x 80 inches / 173 x 203 cm. Roy Lichtenstein's original painting is in the Yale University Art Gallery New Haven, Connecticut. View the original BLAM comic strip by Russ Heath on the 'Deconstructing Roy Lichtenstein' site maintained by David Barsalou. For the last 25 years Barsalou has examined over 30,000 comic books to find the cartoon images Lichtenstein used in his work. David Barsalou is presently Visual Arts Department Chairman, and Art Educator at the High School of Commerce in Springfield, Massachusetts. »Read an interview with Russ Heath from CBA 'Comic Book Artist Special Edition #1'  War artist extraordinaire talks about Haunted Tanks, Sea Devils, Pterodactyl Guy, Cowgirls at War, Sgt. Rock and more of his superb DC Comics material. Roy Lichtenstein's distinctive paintings of the early 1960s are synonymous with the Pop art movement. These bold, oversized images inspired by newspaper advertisements and comic book scenes have been taken as reflecting the artist's fascination with the links between art and popular culture. In this book, Michael Lobel challenges this circumscribed view of Lichtenstein's work, offering a set of compelling new interpretations that reveal the artist's confrontation with a far wider range of issues." This illustrated book makes available for the first time an array of archival materials about Lichtenstein and his work, including photographs of the artist and many newly discovered sources for his imagery in the comics and advertisements of the early 1960s. It also provides new information on the context of the artist's Pop paintings in relation to contemporary developments in advertising culture, mechanical reproduction, and visual technologies. Publisher: Abbeville Press, Inc. Pub. Roy Lichtenstein (1923-1997) became famous in the early 1960s for his deadpan recreations of popular imagery, particularly paintings based on war and romance comics. As this book demonstrates, Lichtenstein's interest in quoting subjects form both high and low art has continued throughout his career, producing a fascinating and varied body of work." Publisher: Little, Brown & Company Pub. Adelman, a friend of the late pop artist, collaborated with Lichtenstein on this book, which presents Lichtenstein's unique version of the alphabet. Here Lichtenstein's unique style celebrates our beloved ABC's, with results that are suprising, delightful, and amusing. D is for a comically vicious, growling dog. H is a horse that races by in dizzying dots and stripes. And A is for Art, Lichtenstein's first pop comic masterpiece, Look Mickey, now in the collection of the National Gallery of Art, Washington, D.C. This mini-retrospective is a must for art lovers, letter lovers, and those just cutting their teeth on the alphabet. Transforming products of mass consumption and the entertainment industry into subjects for art In the late 50s and 60s, American painter Roy Lichtenstein (1923-1997) became one of the most important exponents of Pop Art - that movement which transformed products of mass consumption and the entertainment industry into subjects for art. This apotheosis of banal, everyday objects simultaneously constituted a criticism of the traditional elitist understanding of art. Oil on canvas. Yale University Art Gallery. Read about Roy Lichtenstein and study the full-sized image at Mark Harden's Artchive. The estate of artist Roy Lichtenstein with information about exhibitions of his work. Deconstructing Roy Lichtenstein  David Barsalou's site with all the original comics sources. Art Links  Favorite links for art-teachers and students. "A record was set for pop artist Roy Lichtenstein when his work Happy Tears sold for $7.1m (£4.5m) at Christie's in New York. The 1964 work, depicting a smiling red-haired woman with tears running from her eyes in the artist's trademark comic-book style, was bought by an anonymous bidder. It broke the record for a Lichtenstein. That had been held until now by Kiss II - a work bought for $6m (£3.8m) in 1990. Happy Tears was part of Christie's sale of post-war and contemporary art."